When an instrument plays a "C" in their score, shouldn't it always match the C pitched on the piano? I just didn't "get" how different instruments could play a "C" in their music, but it sounded like a different note - definitely not C! 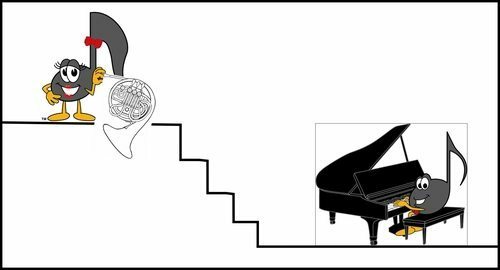 Concert Pitch is simply an interval of transposition so that all instruments can play the same music at the same pitch. Glory's memory joggers had me (finally) remembering the interval of transposition in to Concert Pitch. Being dyslexic (and constantly mixing up right/left and up/down directions) how could I remember (and remind my students) of the direction of the transposition? So I came up with some tips to help me. Just in case there are some teachers who struggle with this too, I thought I would share my tips for Concert Pitch with you. There are instruments that play a C and it sounds like a C on the piano. These are called Concert Pitch Instruments and include the Flute, Oboe, Bassoon, Trombone and the Piano! We also have "B-flat instruments" - the Clarinet and the Trumpet for example. "I've always found it helpful to say to my students for a B-flat instrument, the musician sees "C" in their score, they finger and play "C" on their instrument and we all hear a B-flat. So you take the score for a B-flat instrument and, to write it out for a piano or other C instrument (in other words, to write it out in Concert Pitch), you move it down a Major 2nd. Then both instruments will be playing the same pitch - the trumpet with the original score and the piano with the transposed score." Having strong Visual Learner tendencies, I helped myself remember how to teach this concept by drawing this "picture" for my students (my picture uses stick people - that is what is featured in the picture above - okay, art has never been my forte! LOL). Using your Concert Pitch B-flat Instrument Memory Jogger that you learned on Page 104 in the Advanced Rudiments Workbook, we realize that transposing in to concert pitch for a B-flat Instrument is as simple as transposing down a Major 2. Cool, eh? We also have "F instruments" - the English Horn and the French Horn in F are two examples. When they play a C in their score, it sounds like an F on the piano. Therefore, for the English Horn or French Horn to play in Concert Pitch, the music must be transposed down a Perfect 5. Using your Concert Pitch F Instrument Memory Jogger that you learned on Page 105 in the Advanced Rudiments Workbook, we realize that transposing in to concert pitch for an F Instrument is as simple as transposing down a Perfect 5. I love receiving questions from Teachers. Recently, a teacher emailed me and asked: "Can Concert Pitch be written in either clef? If the test gives a transpose into concert pitch from French horn and is written in the Treble Clef, does it have to be transposed into the Treble Clef as well?" So - after reading this Blog on Concert Pitch, what would your answer be? 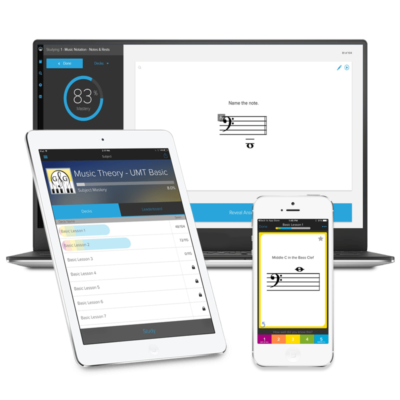 While you are thinking, I want to encourage you to work through the Ultimate Music Theory Workbooks yourself. Now that we have the Complete Rudiments Workbook, this is the perfect opportunity to review your own theory foundation. If you buy the Complete Workbook (and Answer Book) and you do every page - top to bottom - completing all exercises (and marking all exercises using your Complete Answer Book), and you do not learn one single thing, I will refund you your money. When transposing in to Concert Pitch, you will use the Clef given for your original melody. That way, both instruments will be playing the same music at the same pitch in the same clef. If the given melody is in the Alto C Clef and the instructions say "The following melody is written for Trumpet in B-flat. 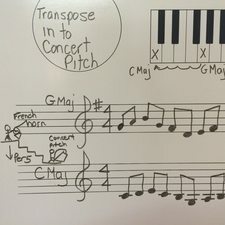 Transpose in to Concert Pitch. ", you will transpose the given melody down a Major 2nd in the Alto C Clef. If the given melody is in the Bass Clef and the instructions say "The following melody is written for French Horn in F. Transpose in to Concert Pitch. ", you will transpose the given melody down a Perfect 5th in the Bass Clef. If you have ever had some confusion understanding Concert Pitch, I do hope that this Blog has helped you! Remember - if you ever had a question, please ask! Your questions are often the inspirations for these Blogs. Thanks for sharing your tips Shelagh. Such an easy way to explain and remember.